Landing Pages & Micro Websites that Convert! Create high converting, beautiful landing pages and micro websites in minutes. 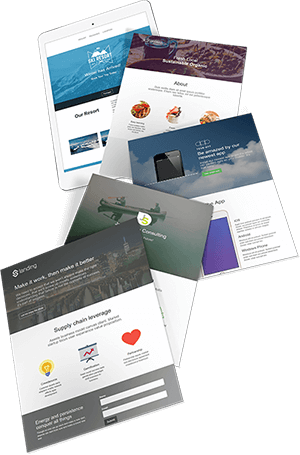 The easiest way to build landing pages and one-page websites that attract customers! Create Intuitive Mirco Websites in Minutes. Quickly create clean and aesthetic webpages that represent your brand. Make Landing Pages Optimized for SEO. It's easy to create landing pages that convert high without being an SEO expert or guru. Easy to Use. Drag & Drop, Zero Coding! Forget paying web designers hundreds for designs. Create designs quicker, for less. Look absolutely great on all devices. Your website should have a very clear purpose, and must fulfill a need to your website traffic in the very best way possible. We make that happen! Grid based designs arrange content that line up evenly and balanced, which leads to a better looking website and ultimately higher sales. It's common to visit websites from different devices in various screen dimensions, so it's important you make your website responsive, "mobile friendly." Great responsive design considers the call to action which needs to be displayed prominently on the website, no matter the browser or display size. It's critical that the design of your website reflects your brand on all devices. You only have one first impression. You must look your absolute best. We've made it easy for you to grow your mailing list. We've integrated MailChimp, Aweber and also GetResponse email marketing services. Security, performance and reliability matter to your customers. That's why we're safe and secure in the cloud. Your pages will always be available. Our customer support team is always available around the clock to help. We're ready anytime you need us, on call for you 24-7, 365 days a year. Effortlessly Integrate with Your WordPress Website. NEW! With our WordPress plugin, you can easily integrate MuchPages into your exisiting WordPress website in just one-click. No programming experience! It's Free to Get Started. Sign Up Today! You're minutes away from your own aesthetically pleasing web page. Sign up free to get started on your first page. Create high converting landing pages, thank you pages, reservations, business pages, events, sales pages, product pages, lead pages, and just about any kind of single page micro website. © 2016-2019 MuchPages. All rights reserved.